I was reading my copy of The Straits Times made available to hotel guests during our stay at Festive Hotel Singapore and this caught my attention - for the top 5 best-selling brands, the rank was dominated by European cars, with one Japanese brand in the mix. 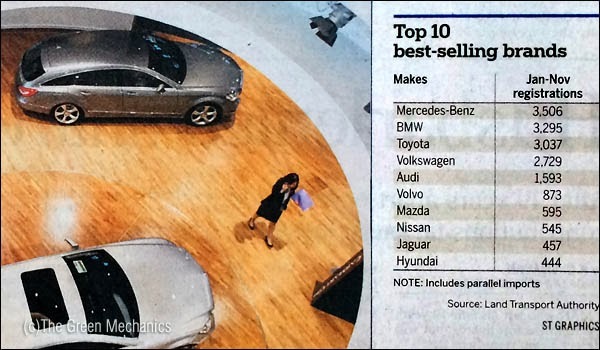 Of the 10 favourite brands in The Lion City, one Korean car maker (Hyundai) made it to the list. Sorry Malaysia, your brands are nowhere in sight here. I'm not questioning why; I'm just reflecting on the popularity of the national cars outside of their country of origin. Proton & Perodua? - dream on? As an example, Proton Preve 1.6 CFE is selling at S$116,000 ( total base price of S$58,000). Kia Forte K3 1.6 (A) 2013 is selling at S$133,999 (total base price of S$67,000). From every angle you look at it, Proton and Perodua will take a back seat in terms of number of cars sold in the rich city state. It's the similar case in Brunei. TheGreenMechanics: While gaining popularity at home, there's still much to be desired of the homegrown car brands with regards to competitiveness and quality in general. Prices are still very high for Malaysian standard of living. I was looking at the pictures first and yes the first thought was European cars dominating the charts.Only the rich can own a car there anyway. Wah!Expensive car tops the charts,that show how rich Singapore is. singapore car prices are more than double our prices. Why complain mister?